Comments Off on …AND a Honeymoon! The wedding is over, and it was a beautiful day. Now Joseph Eagle and I are starting our new marriage…and doing it with a honeymoon! Realistically speaking, and from the perspective of two self-employed people, we had no business taking another (unpaid) week off. After all, Joseph and I got back from our annual vacation on Mt. Desert, Maine on September 7. Between then and now, we were catching up from that AND getting ready for our September 22 wedding. We shouldn’t be going away again, right? Joseph and I fussed about it and then he came to an uncharacteristic conclusion. After thinking it through, Joseph reasoned , “In ten years, I’m not going to remember who came in that week for a massage, but I will remember what we did on our honeymoon.” That made great sense to me. So we planned our week away. Originally we were going to travel to Myrtle Beach, SC. But the week before the wedding, Hurricane Florence hit that area hard. All the devastation put the kibosh on that trip. Looking for an alternative, we chose Lake George, Saratoga Springs, and Cooperstown NY. The first two came to our minds because we were in both of those towns on our very first honeymoon in1988. But we were in both town only briefly on our road-trip to Montreal and Quebec Canada. In Lake George we enjoyed dinner at the famous Sagamore resort, took an afternoon cruise up Lake George, spent a rainy day sheltered in a room overlooking a lake and visioning our future. Our time in Saratoga included walking down the main drag of the charming town, watching a couple of the harness races (I lost $5), visiting the famous springs, and walking through the Spa Park. We added Cooperstown to the trip because I’m a huge baseball fan and I love that little town. And it was sort of on the route home from Saratoga Springs. So, if I was that close to the Baseball Hall of Fame (for me) and the Ommegang Brewery (for Joseph), we had to stop for a couple days. Cooperstown Diner – Seats 20 – MAX! I love Cooperstown…from everything baseball to the lake and the Fenimore Museum and right down to the tiny Cooperstown Diner. 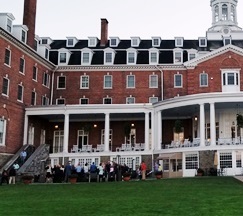 And then there’s the historic Otesaga Resort Hotel. It was our last honeymoon night and we wanted a special dinner. Instead of going to the main dining room, we made reservations at the less stuffy Hawkeye Bar and Grill. We got there a little bit early so we could watch the sun set over the Otesgo Lake. Then we had a drink around the fire-pit on the veranda. It got a little chilly, so we went inside. However, our table wasn’t quite ready so we sat at the bar and people-watched and chatted with other bar folk. When we got seated, we had a couple more drinks and ordered from the pub-style menu. While we were there, a birthday cake was delivered to a man sitting at a nearby table…and before he knew it, the whole restaurant was singing Happy Birthday to him. You should have seen that man’s face light up! Joseph and I meandered through our dinner while a band set up near the bar. When the band started playing, we paid our check and moved to the music area. We watched a soon-to-be bride and groom dancing with some of their bridal party, and a eighty-year-old couple cutting a rug – beautifully, and Joseph and I got up and managed a little rumba and jitterbugging. I think it was my favorite night of our honeymoon. Here’s the very cool thing: When in Lake George for an afternoon in 1988, I didn’t see much of the town. That was because, when Joseph and I got out of our car, I realized I locked my keys in it. We spent a couple hours with the police trying to get into my car. Fast forward to now. When we got there this time, I was driving and wondered if I could find that spot. My brain said, “Seriously? What do you think is the likelihood that you could find the same spot 30 years later?” I decided to let it go. About fifteen minutes later, as Joseph and I explored Canada Street, the main drag, I felt compelled to make a turn. “Where are you going,” Joseph pressed – he was hungry and wanted dinner. “Just checking things out,” I replied. Joseph wasn’t sure, but as soon as we got closer to the parking area where we spent all our Lake George time in 1988, he agreed. Much had changed, but that parking area was almost identical. And so, too, was the view of Lake George. Back then we had just started our first five-year marriage – with hopes and dreams and a ton of uncertainty. We had a plan but everything was a question mark. This time we were starting our seventh five-year marriage. Still with hopes and dreams but, by now, we also a track record of being able to work together to make our dreams our reality. I think one of the most fun things about the Five-Year Marriage is the honeymoon. You will too!